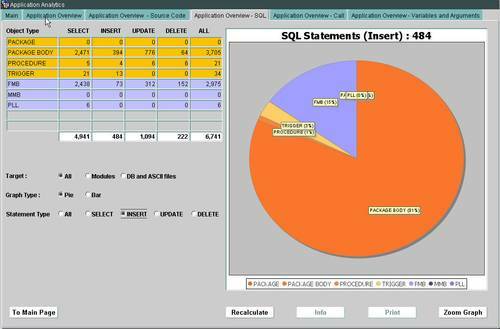 Analyse Oracle Databases and Oracle forms and Reports Applications. Why PITSS.CON Source Code Analytics? Transparency with little Effort: As a full automated solution Source Code Analytics provides a continuous and objective review about the Quality of the Application. This Transparency enables an active Risk Management, a Productivity Improvement and a reduction of Costs. Analyse the complete Oracle Forms Application: PITSS.CON today is the only Analysis Tool on the Market, that analyse the complete Forms Application. Included are all DB Objects, all Forms and Reports Objects like FMB, PLL, OLB, MMB and RDF and the Sub Objects (Blocks, Items, Trigger …). In addition it can analyse embedded SQL in C/C++, ProC, Java and other Programming Languages. Also all SQL-Scripts can be loaded into the PITSS.CON Repository. Concreteness and Measurability: The Use of the Analysis Intelligence of Source Code Analytics enables our Clients to remove the unnecessary in their Application. In addition they get a better Understanding about the Quality and Complexity of the Application. Problems will be visible, progress will be measurable. Objective Estimation of Effort: With PITSS.CON your able to estimate the Effort for e.g. an Change Request with the Help of a Tool. With this Analysis you can reduce the Cost up to 50%. This entry was posted in Pitss.Con. Bookmark the permalink. Hi, Good one. Nice to see Source Code anaylics for forms. Will this support Dynamic SQLs?? Unfortunately we don’t support Dynamic SQL yet. The Problem behind this is that in worst case the User can type the SQL statement in Run-Time. But everything else from Form to DB is included. Also Forms and Reports Properties. I keep you informed on this block about any updated for future releases.